These Hazelnut Butter, Brownie truffles are a dream of mine come true. Some of my favorite flavors, literally rolled into a bite-size treat. I am a lover of all things chocolate, but the addition of hazelnut butter (think: Nutella) wrapped in a blanket of chocolate is next level. Super simple to grab + pop in your mouth, it’s hard to keep track of just how many you’ve eaten (oops!). Fudgy, gooey, chocolatey, melt in your mouth goodness. As I always say: the more chocolate, the merrier! In a recipe that is very chocolate dominant, I wanted to incorporate a very high-quality chocolate to bring out the best flavor. 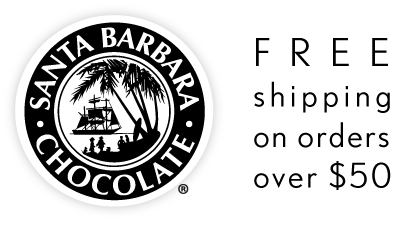 Santa Barbara Chocolate delivers a selection of the best baking chocolates. The cocoa powder brings a delicious fudgy flavor to the brownie crumble, met with the melt-in-your mouth couverture chocolate coating. Interestingly, couverture chocolate contains a higher percentage of cocoa butter (than baking or eating chocolate), which creates that beautiful, hard chocolate coating. Homemade truffles always seemed a little bit daunting to me… especially finding the proper chocolate to fat ratio. Luckily, this brownie-truffle recipe is nearly foul-proof! It is almost as if a cake pop and a chocolate ganache truffle had a child. Fortunately, this recipe is very versatile + can accommodate different flavors or preferences. Option to substitute milk chocolate for dark or white, hazelnut butter for another nut butter, + couverture chocolate for powdered sugar, cocoa powder, or sprinkles! Recipe makes 20 truffles. Time: about 50 minutes. I prefer a lower-sugar brownie for this recipe. The added hazelnut butter + chocolate coating will add a little bit of extra sweetness. Mix melted butter, sugar, and eggs. Add in the vanilla extract. In a separate bowl, combine the cocoa powder, flour, and baking powder. Gradually mix the dry ingredients into the wet, mixing well to combine. Pour brownie mixture into an oiled 8”x8” baking dish. Bake @ 350F for about 25 minutes or until thoroughly cooked. Let the brownies completely cool. While the brownies are baking + cooling, you can prepare the hazelnut butter. I have made a lot of homemade nut butter in my day and Nutella has always been a guilty pleasure of mine, but I never really thought of making my own! I was pleasantly surprised to realize that raw hazelnut butter tastes just like Nutella, is much lower in sugar, + is super easy to make. It is the perfect complement to the chocolate flavor in these truffles + acts as a glue to hold them together. Put 1 cup of raw hazelnuts in a food processor (or other high-powered blender). Blend on low for about 3 minutes. It will initially form a crumbly mixture but continue to blend until it forms a smooth butter. Once the brownies have cooled, crumble them into medium-large chunks. Using your hands, mix 2 cups of brownie crumbles with 4 tablespoons of hazelnut butter. Roll + press the mixture into golf ball size balls. If the mixture is too dry or crumbly, add more hazelnut butter. Option to place balls in the freezer for 5-10 minutes (although, not much longer!) as this may make it a little easier to dip + coat in chocolate, although not required. Meanwhile, melt Santa Barbara coverture chocolate (milk, dark, or white) until smooth. Dip + coat the brownie balls in the chocolate. Let the chocolate harden completely before enjoying. Store in the refrigerator. Bri is the founder of Bunch of Bri, a healthy lifestyle blog comprised of her journey as a twenty-something. Self-proclaimed plant-mom, coffee addict, + wellness enthusiast. She is inspired by helping people find a balanced, sustainable, + attainable lifestyle. Meanwhile, encouraging a positive relationship with food with an emphasis on simple, real ingredients.